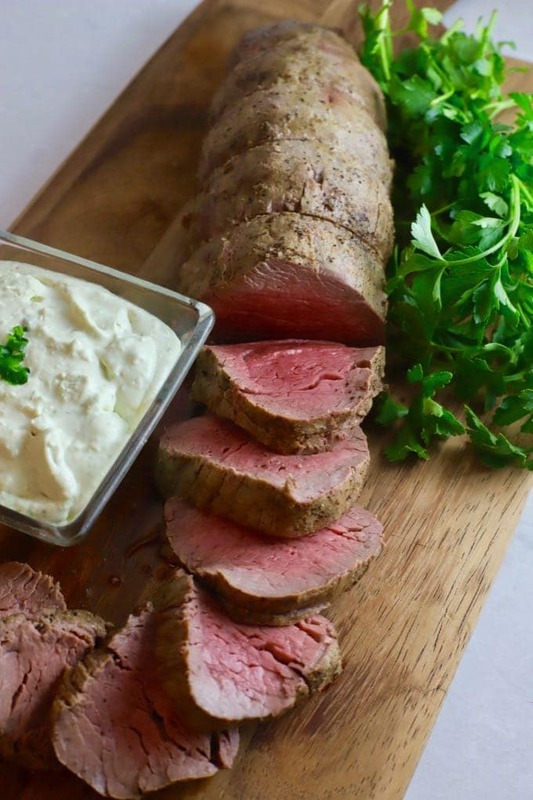 Nothing says the holidays like a showstopping, melt-in-your-mouth, Perfect Beef Tenderloin with Gorgonzola Sauce. This elegant and impressive, oven roasted dish is a classic entrée for Christmas Dinner or makes a great appetizer for a holiday or New Year’s Eve party. Check out this easy recipe, it’s a must try! Don’t stress out about what to make for your Christmas dinner because I have you covered. The holidays are all about spending time with your family and friends, and the last thing you should be worrying about is what to serve. 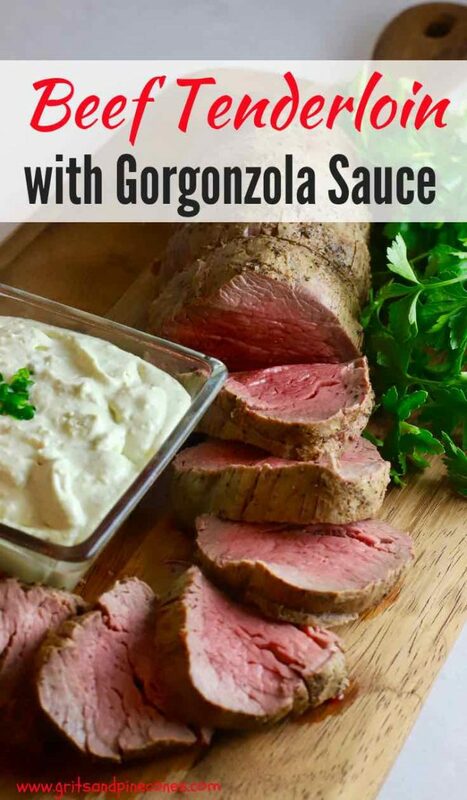 Today I’m sharing a delicious and easy to make perfect beef tenderloin recipe with a tasty gorgonzola sauce that is as simple and low-key as it is elegant and guaranteed to impress your family and friends! 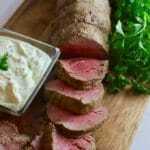 This is the best beef tenderloin recipe I have found! It only takes a few minutes to prep, then you pop the beef in the oven for just under an hour and the oven does the rest. The scrumptious, make-ahead Gorgonzola Sauce is just as easy; all you do is throw everything in your food processor and let it do its magic. Then, all you have to do is sit back and bask in the compliments! I first had this delicious gorgonzola sauce at my friend Kerri’s house for a supper club dinner. She served it with grilled beef tenderloin, and it was fabulous! I had been looking for for an easy no-cook sauce for beef that didn’t involve making a bearnaise type sauce. And, this yummy sauce is exactly what I was looking for. I can promise you will be glad you found it too! 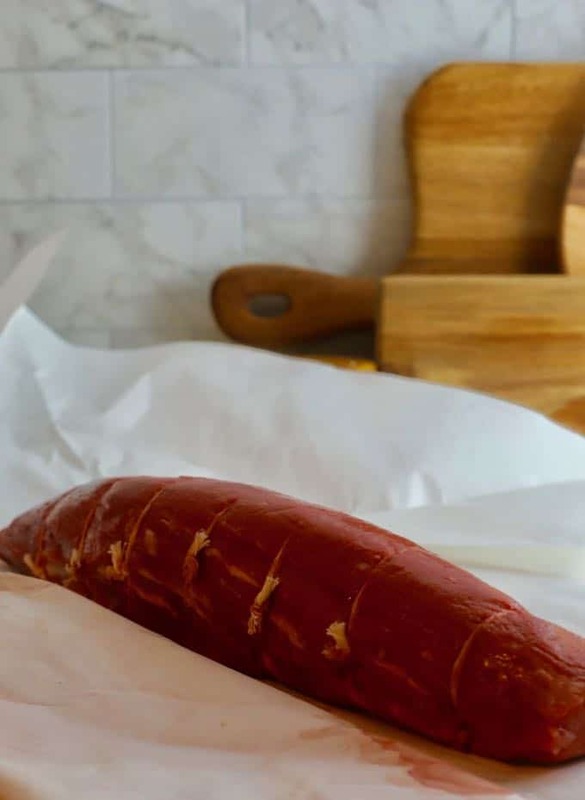 The ingredients for this dish are simple, you will need a center cut beef tenderloin which has been trimmed and tied by your butcher, butter, kosher salt, and pepper. About an hour before you are ready to cook it, remove beef from the refrigerator and allow it to come to room temperature. Place beef on a wire rack on a baking sheet with sides. Rub butter all over the beef and sprinkle with salt and pepper. Insert a meat thermometer into the thickest part of the beef. Bake until the meat thermometer registers 130 degrees (medium rare) which should take about 35-45 minutes depending on the thickness of the tenderloin. Remove from the oven, cover loosely with foil, and let the meat rest for at least 15-20 minutes before slicing. Here is a guide to when you should remove your beef tenderloin from the oven, depending on the desired degree of doneness. While the beef rests the internal temperature of the meat will increase by about five degrees. Rare – bright purple-red cool center: remove the roast from the oven at 120 degrees to serve it at 125 degrees F.
Medium Rare – bright red warm center: remove the roast from the oven at 130 degrees to serve it at 135 degrees F.
Medium – rich pink center: remove the roast from the oven at 140 degrees to serve it at 145 degrees F.
Medium Well – tan with a slightly pink center: remove the roast from the oven at 150 degrees to serve it at 155 degrees F.
Well Done – tan to brown center: remove the roast from the oven at 155 degrees to serve it at 160 degrees F.
For the gorgonzola sauce, you need gorgonzola cheese, cream cheese, mayonnaise, sour cream, a bunch of green onions or scallions, Worcestershire sauce, kosher salt, and pepper. Place all ingredients in the bowl of a food processor fitted with the metal s-shaped blade. Process until smooth and creamy. Serve in a small bowl at room temperature. Slice and serve the beef tenderloin with the gorgonzola sauce. 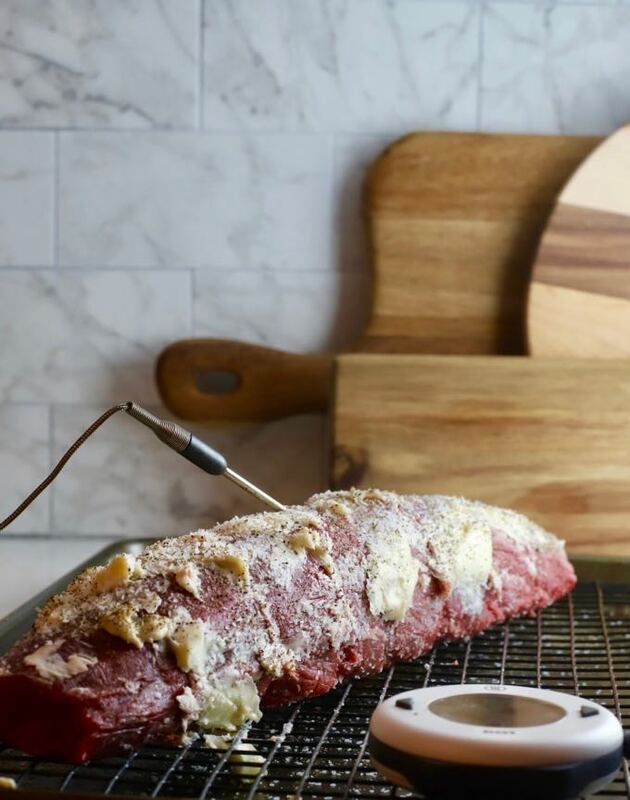 When you purchase the beef tenderloin, be sure to have your butcher remove all of the “silver skin” (a thick layer of silvery connective tissue) or remove it yourself with a sharp knife. Also, ask your butcher to “tie it” for you. This ensures that the beef is the same thickness all the way around and will cook evenly. For the best flavor, prior to cooking your beef tenderloin be generous in seasoning with the salt and pepper. I like to use either kosher or sea salt. Be sure to let your beef tenderloin “rest” lightly covered with foil for 15-20 minutes before you cut it. The beef will continue cooking, the temperature will increase by about five degrees, and this gives the juices a chance to redistribute. Beef tenderloin is best served rare or medium-rare. If you have family members or guests who like their meat well-done, consider cutting the whole tenderloin into pieces and cooking each piece to the desired temperatures. Beef tenderloin is expensive. If you do not have a good instant-read meat thermometer, invest in one. I like and use a DOT Oven Alarm thermometer with a temperature probe. I like it because I can insert the probe in the meat, place the meat in the oven or on the grill, set the temperature, and the DOT beeps when that temperature is reached. Of course, there are lots of other meat thermometer options available. The important thing is to use one and test the thickest part of the roast! The gorgonzola sauce can be made ahead and stored covered in the refrigerator for up to 2 days before serving. *This recipe was originally published December 14, 2016. It is being republished today with new images and an updated recipe. 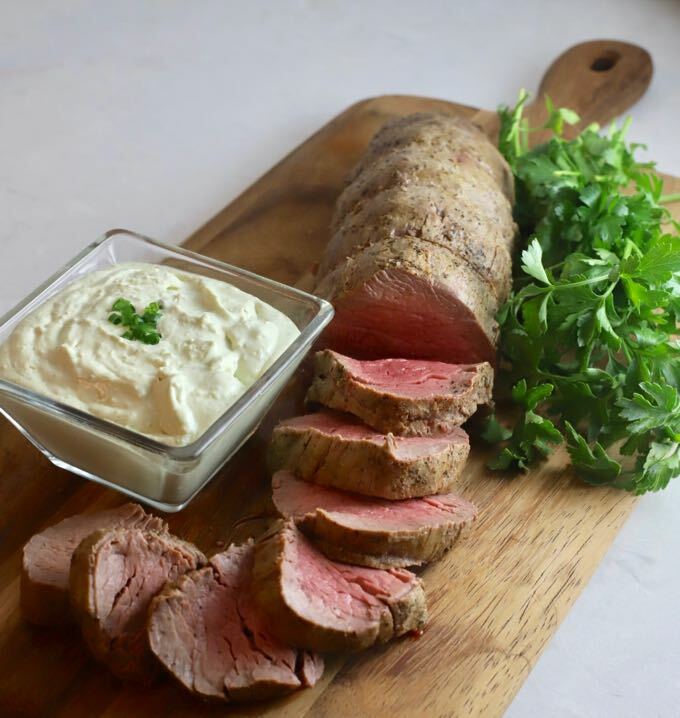 This is a delicious and easy to make classic roasted beef tenderloin recipe with a tasty gorgonzola sauce that is as simple and low-key as it is elegant and guaranteed to impress your family and friends! Place beef on a wire rack on a baking sheet with sides. Rub butter all over the beef and sprinkle liberally with kosher or sea salt and pepper. Insert a meat thermometer into the thickest part of the filet. Bake until the meat thermometer registers 130 degrees (medium rare) which should take about 35-55 minutes depending on the thickness of the filet. Remove from the oven and cover loosely with foil for at least 15-20 minutes before slicing. The meat temperature will increase by about 5 degrees while it rests. 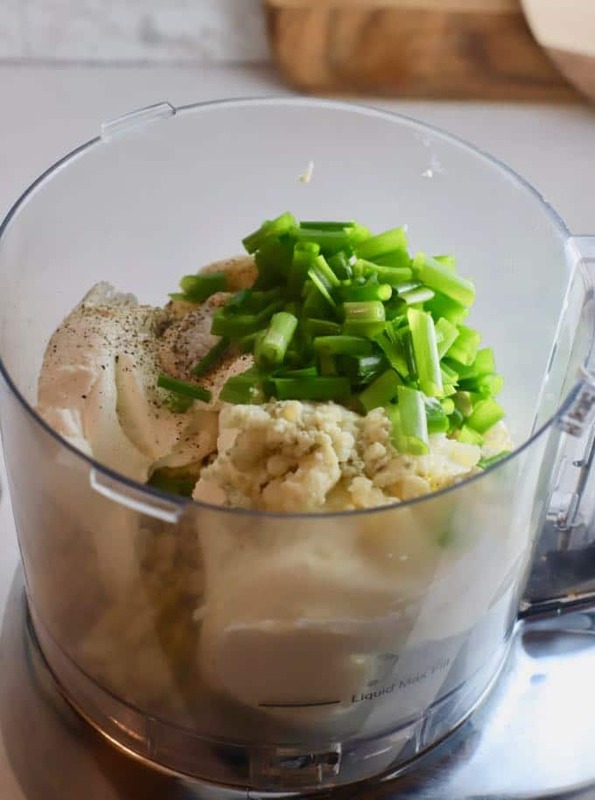 Place all ingredients in the bowl of a food processor and process until smooth and creamy. Serve at room temperature. Here is a guide to when you should remove your beef tenderloin from the oven depending on the desired degree of doneness. While the beef rests the internal temperature of the meat will increase by about five more degrees. Rare - bright purple-red cool center: remove the roast from the oven at 120 degrees to serve it at 125 degrees F.
Medium Rare -bright red, warm center: remove the roast from the oven at 130 degrees to serve it at 135 degrees F.
Medium - rich pink center: remove the roast from the oven at 140 degrees to serve it at 145 degrees F.
Medium Well - tan with a slightly pink center: remove the roast from the oven at 150 degrees to serve it at 155 degrees F.
Well Done - tan to brown center: remove the roast from the oven at 155 degrees to serve it at 160 degrees F.
When you purchase the beef tenderloin, be sure to have your butcher remove all of the "silver skin" (a thick layer of silvery connective tissue) or remove it yourself with a sharp knife. Also, ask your butcher to "tie it" for you. This ensures that the beef is the same thickness all the way around and will cook evenly. Be sure to let your beef tenderloin "rest" lightly covered with foil for 15-20 minutes before you cut it. The beef will continue cooking, the temperature will increase by about five degrees, and this gives the juices a chance to redistribute. We cooked this one on our Big Green Egg grill and it turned out perfect! Our Supper Club was impressed with this one and the sauce was amazing! This is a great dish for a holiday or when you’re trying to feed a large group. Thanks so much for sharing and I’m so glad you like the recipe! What can I use for the sauce other then a good processor? Blender? Wire wisk in my KitchenAid? I’ve never done it, but I think you should be able to make the gorgonzola sauce in your blender. I don’t think the wire whisk would be able to pulverize the green onions so you end up with a smooth sauce. Can the Gorgonzola sauce be made earlier in the day and brought back to room temperature? Hi Leigh, yes it can! Hope you enjoy it!